Pastoral Stoles: How Much do They Cost? How much does it cost to make a pastoral stole? We all ponder that question when we undertake an Ecclesiastical Sewing project. Parishioners often desire to give the gift of a stole, either for a specific need, or to mark a special event such as an ordination or the celebration of an anniversary or church festival. Stoles are expensive to purchase from a Vestment House, ranging from a minimum of $100 or more for a basic no frills style, to several hundred dollars for stoles made in rich brocades or embellished with embroidery or galloon trims. 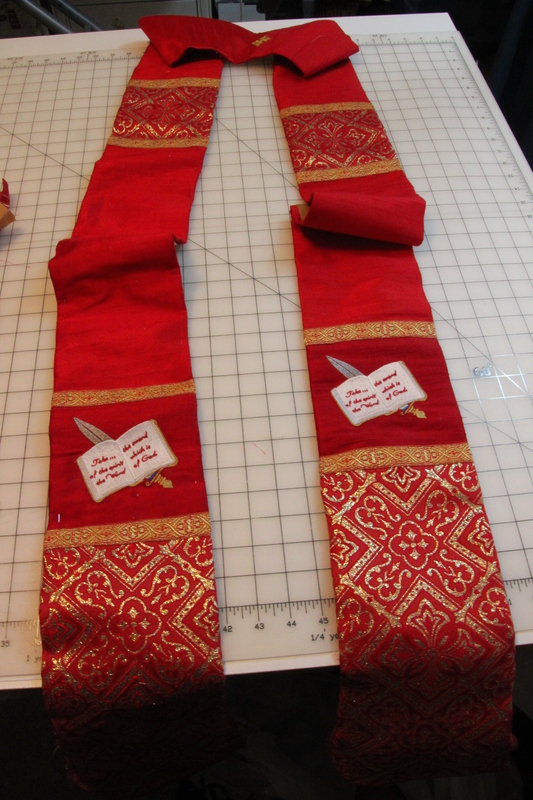 When I started the three Red Pentecost stoles, it was a bit of an experiment with the goal of meeting two challenges. The first challenge: to utilize the same base materials in each stole to see what the resulting design possibilities might be. The second: to see how the price might vary for each stole, using the same base material in different proportions, while using a variety of other design features, materials and trims. The goal of the experiment is to offer ideas and suggestions that might aid others with creative design, while at the same time, managing their church vestment budget. This stole features a machine embroidery design portraying a "Sword of the Spirit" symbol. This embroidery design becomes the base around which everything else comes together. The liturgical stole is made using three fabrics on the face side. Silk Dupioni in a bright Pentecost Red is the base fabric for the stole. The second fabric is a deeper red Silk Dupioni embellished with the machine embroidery design of a Bible and Sword of the Spirit. The final fabric is a red and gold brocatelle used as an orphrey on both the chest and at the lower edge of the stole. The easiest way to purchase the Red Dupioni Silk for the base of the stole is to order pre-cut "stole quarters" for either a 4″ pastoral stole, or wider and longer lengths for a V-back and other stole styles. A pre-cut pastoral "stole quarter" is pre-cut piece of fabric which is approximately 14″ wide by 60″ in long. Quilters already know about purchasing fabric in user friendly sizes such as "fat quarters" to minimize waste when one is doing a small project. Purchasing a pre-cut "stole quarter" is the same idea. Rather than purchasing 60″ length of fabric that is 45″ or 54″ wide, one only purchases enough fabric for making a single stole. The "stole quarter" in silk dupioni is less that $20. The deeper red appliques were purchased from a friend who does machine embroidery. I requested that she use a red she had on had and embroidery that specific design. It was a gamble with the reds, not knowing if they would look well together, but there are always ways of working those things out. The embroidered appliques with the Bibles were $15 each for a total of $30. Not bad. The machine embroidery adds much to a stole. The next fabric up is the Red and Gold Brocatelle. The order was for 1/2 yard which totaled approximately $53. Of that 1/2 yard piece, only a small section was used which is about 1/3 of the piece, so estimate $18 for the red and gold brocatelle. Other items needed to complete the pastoral stole include a canvas interfacing which comes to less than $5, a lining fabric of gold which again was less than $5. There is a tiny gold cross applique stitched at the Center back neckline which cost $1. The costs add up quickly on the final two items: the red and gold galloon trim was slightly less than $20, while 12 tassels were approximately $32. Admittedly, tassels are a spendy addition to a stole, but they finish the stole end so very nicely! And sometimes they are a life saver by providing that extra 3″ in length. What are the damages for this stole? At $130, the price is very reasonable price for a stole which features design details such as a rich brocade, gold and red galloon trim, and machine embroidered emblem. One could eliminate the tassels, there by saving over $30, and the stole would still look fantastic. And that is a look at the Red Pentecost Sword and the Spirit Stole.